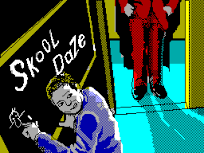 Little Bit of History: Skool Daze was a game originally released on the ZX Spectrum in 1984 and also ported to the Commodore 64. Published by Microsphere, the game was the brainchild of David and Helen Reidy. Helen was a teacher while David remembered messing around in school. So the idea of making a game based in a school was born. Little Bit of Plot/Story: The plot has you playing as Eric trying to get his report card from the staff room. You would have to use various tactics to obtain clues to get your report card back. But you would have to attend classes and avoid getting into trouble. If you were caught not in class or causing trouble you’d get lines, too many lines and it was game over. Boy Wander the tear-away, Einstein the swot and Angelface the bully. Plus there were the teachers; Mr Wacker the Headmaster, Mr Creak History teacher, Mr Whithit Geography teacher and Mr Rockitt Science teacher. Plus there were several other unnamed and unplayable pupils. Little Bit of Influence: Though the game spawned it’s own sequel with: Back To Skool. This game also paved the way for what we now call “open world/sandbox” games. While you had a goal to complete, you could go about it anyway you wanted and even ignore the plot all together and just make your own fun by using your slingshot, punching pupils (and teachers if you were sneaky) writing on the blackboards in class, plus many other things to discover and enjoy. So you could really do what you wanted within the game’s universe. It was one of the very early “open world/sandbox” games and paved the way for bigger games like Grand Theft Auto and even a massive influence on Rockstar’s own great game: Bully. Little Bit of Memories: This was strange as we often played games back then to get away from school and school work…and yet here we are playing a game set in school. Best memories I have of this game was the fact you could rename any of the main characters, including Eric and the teachers. 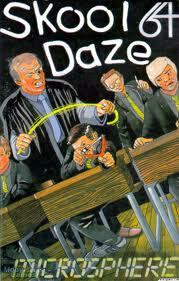 So if you had a bad day at school, come home and load up Skool Daze, rename the characters to people you didn’t like from school and take out your annoyances on them. Little Bit of Playability: I personally loved this game back in the day, but time has not been kind to it and found it very clunky, especially with the controls and really found it unplayable now. There was an unofficial remake called Klass Of 99 (free download) which fares a little better you can download for your PC. Or you could try the amazing Rockstar “tribute” to Skool Daze: Bully. But for me, the original just has not held up well despite being so great back then. This entry was posted in LBoG: Game Overviews and tagged game reviews, Little bits of gaming, retro gaming, Retro gaming blog, Skool Daze, ZX Spectrum on 16/04/2015 by Steve Perrin.